894 SPE KIRIBATI (1979) Children*. Set of 4 overprinted SPECIMEN. IYC issue. Scott Nos 345-8, Yvert Nos 21-4. 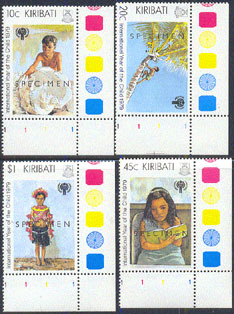 3567 SPE KIRIBATI (1982) Birds*. Set of 17 overprinted SPECIMEN. Scott Nos 384-99, Yvert Nos 62-81. (Note: 55c value not included as it was issued 3 years later).